I'm designing my own saber for a school project (class in machining) and am up to the speaker holder/chassis. I just ordered and received my 2w bass speaker(thanks TCSS) and was wondering what people's experience has been with those as far as leaving the holder open in the back vs sealing it up. I'm planning on using the NB with the Dark Meat sound font (or similar) and a holder style similar to the V4. Anyways, thanks all for the input. My first saber uses the 2w bass and it's open at the back. The sound resonates right through the hilt, even with the chassis in place and it's loud. I haven't tried sealing it in. Thanks for the feedback Greenie! So anyone else? 120 views and no body else has an opinion? Greenie's response was right on the money. You can try sealing it with something temporarily to hear the difference for yourself, and then unseal it if you don't like the results. 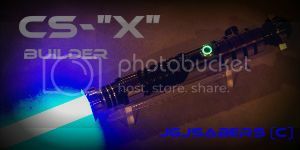 The method Greenie mentions is how I've built mine since I started building sabers with sound, waaaay back in 2004. I have just preferred the deeper tone resonating throughout the hilt provides. On some sabers, I even drill extra vent holes that are hidden beneath shrouds to enhance the sound further, thereby reducing the tone and increasing the volume.